In an attempt for hospitals to successfully address the low-volume issue, one of the many strategies that can be applied in these situations requires analyzing and addressing the “leakage” issue. Leakage can be defined as the difference between the size of the market and a hospital’s share of that market. If a hospital’s market produced 100 cardiac surgeries in a specific year, and its share of that same market is 78, or 78 percent, then 22 patients, or 22 percent went to another provider (either in- or out-of-the-market), or “leaked” from the hospital’s market and potential share. Assuming the overall size of the market is reasonable, and there is additional market share to be had, trying to increase market share is a reasonable growth strategy. Note that if there are only 75 to 100 total cases in a given total market, and two hospitals are competing over the same market, then neither program will ever attain sufficient market share to reach moderate to high-volume status. One of these two hospitals probably needs to divest their program. It is important to stress that leakage can be external – originating in the marketplace outside the hospital system entirely, or internal to the hospital system itself. Realistically, internal leakage is the more critical priority as it is under the direct control (or at least influence) of the hospital and its medical staff. Understanding the underlying reasons behind leakage and basing any development strategies on a thorough analysis of your situation is critical. That being said, it is often complex, information-poor and multi-factorial, challenging the hospital to understand the true reasons behind its market position and what changes may be necessary to address any underlying issues. Here are a few thoughts about leakage. Understanding the issue begins with information. 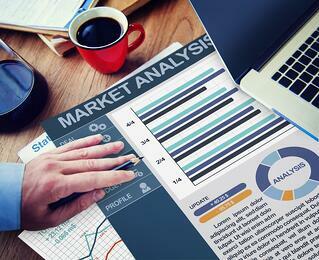 Acquiring appropriate, accurate and timely market share data is critical to understanding the market. State-specific mandated databases, commercial databases, Medicare-only databases or other sources can be used – each with pros and cons. Our experience emphasizes the criticality of defining cardiac surgery appropriately. (Please see Second in a Series: Low-Volume Cardiac Surgery Programs – Looking “Behind” the Numbers.) Lumping and splitting within the broad category of cardiac surgery can get you in trouble and suggest inferences that are misleading. For example, some canned databases define cardiac surgery as one broad category, which negates the real differences in market size, physician and program capabilities (and thus market share) between CABG and valve surgery. Knowing how many patients go to what hospital for what specific surgical procedure serves as the necessary basis for critical analyses. If your hospital cannot meet the minimum volume/quality standards to provide a specific service, such as endovascular valve replacement, patients from your market area should legitimately be referred to another provider who can meet these specific clinical needs and outcome standards. If a major employer in your market has an exclusive center-of-excellence-type agreement with, say, the Cleveland Clinic, then eligible patients will bypass your hospital and go there, no matter what the local hospital’s capabilities may be. If your hospital lacks a specific cardiac physician subspecialty (e.g., cardiac valve repair vs. replacement capabilities). Do not forget that achieving 100 percent market share for any clinical service is unrealistic under almost all market circumstances. Analyze your hospital’s (and other’s) true capabilities. Once you know who went where and for what, you can ask the question, “Why did they go there and not stay here and come to our hospital.” Part of that answer is program capabilities and reputation. A program assessment will need to ascertain relative strengths and weakness, including service offerings, physician staffing capabilities, overall performance (costs position, quality outcomes, patient experience, etc. ), and other factors. Reputation in the market is best assessed with community surveys. Both activities are often best left to an independent third-party content expert. What is the competition doing? Once you understand your internal capabilities and your relative strengths and weaknesses, you can assess the competition in a similar fashion. All hospital’s function within a competitive milieu unless they are sole community providers. Understanding the competition is not easy, but it is critical to assessing leakage. Interviewing physicians, major payers, large employers and other providers can often provide insight into you (and your competitor) hospital’s capabilities and reputation. Do not forget to analyze referral sources. While it seems self-evident, virtually all cardiac surgery patients are referred by cardiologists. They are the basis for any program volume. Interviewing cardiologists (as well as key referring primary care physicians who are familiar with the referral environment) can often pinpoint issues specific to “internal” leakage. The number and subspecialty of local cardiologists plays an important part in the volume of referrals. If a program gains or loses cardiologists in a specific subspecialty, logically, referrals to cardiac surgeons may fluctuate. Additionally, referrals from cardiologist to cardiac surgeon may be based on clinical issues (competency, sub- specialization, outcomes) as well as non-clinical issues such as personality, communication, availability/timeliness of consults, and a host of others – some of which can be both challenging to identify and address. Realistically, employed versus independent physicians do not necessarily solve the overall leakage program by corporate requests to keep patients within the hospital’s network; internal leakage is more pervasive than some imagine. Multifactorial interactions. Internal or external leakage is typically not caused by a single issue, but is multifactorial and interactive, with multiple issues that will need to be diagnosed and treated. Successfully addressing market leakage can be seen as an issue requiring both appropriate program diagnosis and definitive treatment. For external leakage, appropriate information and assessment can size the market and help define the issue of its provider market shares, composition, competitor advantages and disadvantages and the patient’s ultimate disposition. Internal leakage can be assessed by program capabilities and deficits, cardiac physician subspecialization, overall staff capabilities and referral patterns. Realistically, each of these interdependent factors can be responsible for some portion of the overall leakage equation. Careful and comprehensive analysis is called for and definitive action, no matter how problematic, challenging and potentially requiring an extensive time commitment, will need to take place to maximize program potential, development and success in a specific market. Low-volume cardiac surgery programs cannot be “rehabilitated” by solving any leakage problem in a vacuum, but within the overall context of the market, can be a vital part of successfully addressing a going-forward strategy. If you are interested in learning more about strategies to deal with your low-volume cardiac surgery program and a program assessment for cardiovascular services, please contact CFA at (949) 443-4005 or by e-mail at cfa@charlesfrancassociates.com. In our continuing series on low-volume cardiac surgery programs, we now incorporate the Center of Excellence (COE) concept into our discussions. We previously posted a blog discussing this topic in a broad sense (see Can Low-Volume Cardiac Surgery Programs be Excellent? posted November 16, 2016), in which we discussed the challenge of low-volume surgical programs. In this blog we discussed the question of whether or not a low-volume program could be excellent, and concluded that it is possible, witnessed by the fact that a number of low-volume cardiac surgery programs made the 2017 Truven Health Analytics’ Top 50 Cardiovascular Hospitals in the U.S., in six broad areas of quality and cost measures applicable to CABG surgery. In an effort to help those estimated 500 or so low-volume cardiac surgery programs that may struggle to improve their performance despite low volumes, we applied CFA’s Center of Excellence (COE) criteria specifically to the cardiac surgery service within a hospital CV service line. This list is in summary form, but is meant to provide the reader with more comprehensive characteristics of a COE beyond the obvious top-of-mind attribute of high quality clinical outcomes. Yes, that is fundamentally required, but there are several other clinical and programmatic characteristics that should be addressed to achieve true COE status. Hopefully, we have captured the essence in the list to follow. Here is our listing of the characteristics of a low-volume cardiac surgery program (always to be considered within the context of a comprehensive cardiovascular program of excellence). We urge the reader to critically apply these criteria to their own program and see how your program stacks up against the this set of ideal program characteristics. Corporate philosophy and culture supportive of overall performance excellence; goals are established and resources appropriately allocated to support performance objectives and all administrative staff is held accountable for specified performance. In an evolving marketplace, corporate philosophy encourages the need to compete directly and transparently on the basis of quality outcomes, innovative care provision, organizational capabilities, cost and pricing. An appropriate organizational and managerial structure is in place to plan, develop and implement operating objectives that fosters and rewards accountability, stakeholder input, innovation and creativity. An appropriate management team, led by a cardiovascular service line administrator, is in place and tasked with all aspects of service line operations to maximize performance. Physicians are integrated into the management structure, and as medical directors of subspecialty services. Rigorous performance improvement culture and ongoing activities focus on achieving a high level of clinical quality outcomes for all patients, regardless of volumes. Best practices (in the form of guidelines, protocols and algorithms) are incorporated into care provision and patient appropriateness criteria and risk assessment is rigorously applied. Inappropriate surgical candidates are systematically referred elsewhere. Transparency is promoted; key metrics for outcomes, pricing and other important information are publically available. Participate in the Society of Thoracic Surgeons (STS) National Database and the American College of Cardiology (ACC) National Cardiovascular Data Registry – NCDR® as a means for the hospital to routinely measure its current performance against peer hospital metrics and identify issues for immediate and decisive action. Work to achieve The Joint Commission’s Comprehensive Cardiac Center (CCC) Certification status for CABG Service and/or Valve Replacement/Repair Service (as one of ten possible service requirements for Program Certification). We will have more to say about the specific subject of cardiovascular program performance improvement in an upcoming blog. Surgeon(s) and cardiologist(s) that anchor and provide patient care for the program consistently produce high quality clinical outcomes measured against key benchmarks for peer hospitals, regardless of challenging volumes. Rigorous consensus-based standards are followed, including appropriateness criteria, risk-assessment, clinical outcomes, readmission rates, and cost per case, among others. Key physicians are aligned and integrated into the overall health system, hospital and service-line management/operational structure, including performance improvement activities, defined management role, incentive compensation programs, adoption of best practices, current research/technologies and innovations, and are communicative and collaborative with all team disciplines. Cost management is ongoing, with high-cost drivers identified and subjected to rigorous cost reduction. Specific low-volume service components (i.e., cardiac surgery) that may be “unprofitable” are consistently subjected to an ongoing cost management focus. Cost/price per case is highly competitive compared to local/regional benchmarks. Episodes of care have been defined and pricing/costing established across the continuum for potential bundled pricing or other financing/care innovations. Although it appears CMS may cancel the planned cardiac bundled pricing initiatives (see our blog from August 14, 2017), other payers have developed similar, innovative contracting models. Physicians actively participate in cost containment and are appropriately incentivized to enhance specific or overall financial performance. Existing infrastructure, inclusive of technology, facilities, information and supportive systems and staffing, is optimized to promote ongoing activities in the most efficient and effective manner possible. Clinical technology is state-of-the-art designed and operated to optimize functionality, meet specific clinical needs and optimally match patient utilization volumes. Facilities are modern, patient-friendly, easy to use, an appropriate mix of in- and outpatient, and located geographically to maximize access and patient experience. Information systems, including EHR, PACS, CVIS, proprietary/public comparative databases, benchmarking, data-mining, finance and other requirements, are state-of-the-art, integrated and appropriately staffed by experienced personnel. Clinical program staff is highly knowledgeable, experienced, collaborative, team-oriented, and understand their role in providing excellence and optimizing patient experience. Surgical, Cardiac Cath Lab, Noninvasive Diagnostic and other support teams are highly experienced, optimally deployed and effectively compensated. Retention is high and registry usage minimized. Last, but certainly not less important, the patient’s experience at your program – the sum total of the patient’s healthcare experience – is prioritized and aggressively managed by all members of the team. Low-volume cardiac surgery programs are increasingly common and ultimately challenged to meet or exceed excellence expectations for self-preservation. Some will go beyond mere self-preservation and strive for (and achieve) excellence. At the same time, these hospitals must recognize that ultimate, long-term preservation of their program may lead to the need for focused program development, or as a last resort, ultimate consolidation or divestiture, simply due to the changing health care delivery and payer markets and the need to successfully focus on attaining value-based status. CFA will be posting additional articles regarding developing excellence within low-volume cardiac programs as part of our ongoing series in the near future. As always, CFA invites your comments, suggestions and questions. If you are interested in learning more about strategies to deal with low-volume cardiac surgery programs and programmatic assessment for cardiovascular services, please contact CFA at (949) 443-4005 or by e-mail at cfa@charlesfrancassociates.com. CFA will be posting its updated Characteristics of a Cardiovascular Center of Excellence in the near future. This will be a comprehensive look at the ten characteristics that define a “true” CV COE. 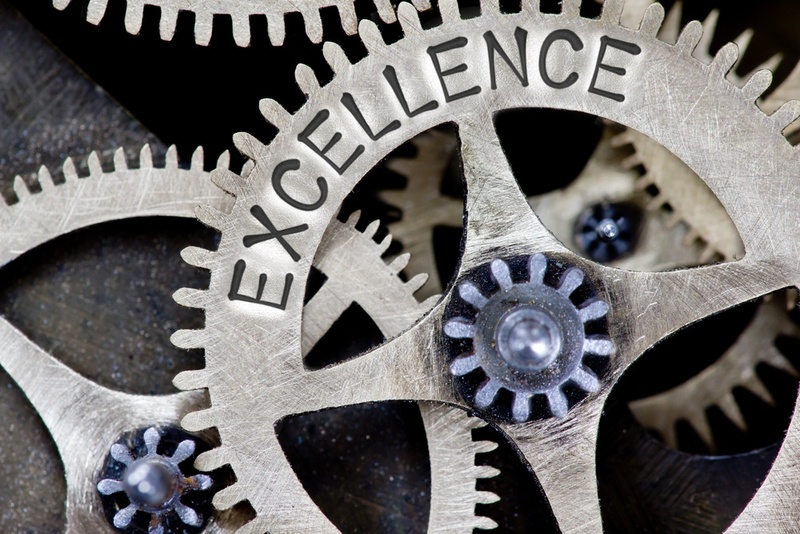 In our recent post, Low-Volume Cardiac Surgery Program “Excellence”, we initiated a multi-part series discussion on the theme of cardiac program excellence. In this article, we address the importance of understanding one’s cardiac program volumes and the difference in key types of procedures that comprise your cardiac surgery program’s procedure volume. If information is vital to making informed decisions, then appropriate analysis of low-volume cardiac surgery programs must include informed analytics. CFA recently received a call from a hospital administrator concerned that his cardiac surgery program was faltering and steadily declining in volume. When we asked how many cardiac surgeries they performed, he replied, “Well, we budgeted for 48 this fiscal year.” This was down from well over one hundred surgeries during the previous years. By most any standard, 48 annual cardiac surgical procedures constitutes a low volume program. Our next question to him was important. We asked “48 what exactly?” When we probed, he wasn’t sure what the answer was – 48 total cardiac surgeries, CABG procedures only, CABG/Valve cases, other thoracic, other major vascular, all cases performed by his hospital’s cardiothoracic (CT) surgeon, or what exactly[i]? To analyze the situation and develop strategic options going-forward, hospitals will need to do a thorough analysis of their own internal volumes, local and regional market volumes and the trends within that market; generally reduced to market size and share, with trends over time – in other words, the “numbers.” While this seems obvious, anything more than a cursory analysis requires “looking behind the numbers” to appropriately segment available data in a meaningful way. Frequently, CFA is faced with a dearth of usable market-based data, or data that is inappropriately segmented, lumped or split, restricting the ability of the user to produce meaningful results[ii]. This is where our experience kicks in; producing meaningful analytics, often from challenging source materials, and using this data to developing consequential “root-cause” analyses and supportable volume projections. In this blog, we will look behind the numbers for cardiac surgery. Comparative databases, where available, are typically designed and developed by generalists with limited clinical cardiovascular knowledge. CFA has actually served as a content expert in some database development, but still the nomenclature and documentation lags behind real-world usage and technological change. A good case in point is cardiac surgery[iii]. To understand the cardiac surgery market and to reveal the issues that may exist behind the numbers, one must look carefully, filling in gaps in knowledge with experience and relying upon that experience to both identify the underlying issues and understand the implications that logically follow. As one can see, there is more to “cardiac surgery” than CABG and valves! 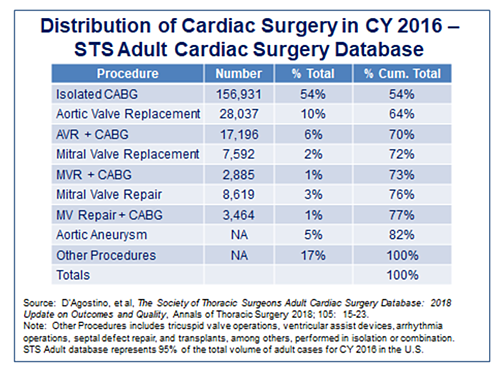 To further this analysis, let’s look at a typical distribution of the three major categories of cardiac surgery cases (note that Endovascular Cardiac Valve Replacement is lumped with Valve Surgery in this analysis, and should be considered separately – see below), this time using the STS database for 2015 as an example. Of course, local/regional distribution will vary, depending on factors such as demographics (the older the population, the higher the prevalence of valve surgery), surgical capability (some CT surgeons do not do enough valve surgery to retain competence; some hospitals virtually specialize in cardiac valve surgery work), mix of valve cases (aortic, mitral, repair versus replace), and so on. The increase in endovascular valve replacement procedures. Transcatheter aortic valve replacement (TAVR) is replacing open surgical procedures for medium- to high-risk individuals, but can best be done by qualified surgeons at high volume institutions that meet rigorous Medicare volume and quality requirements. The overall clinical interest level, capability and/or quality outcomes of individual surgeons. Note that further differentiation can be made on specific types of valve procedures – aortic repair or replacement, mitral valve repair or replacement and/or combination valve/CABG procedures – and the capability and specialization of the surgical staff to deal with these. The overall reputation and brand-awareness of the hospital’s program in its competitive marketplace. If you are interested in learning more about strategies to deal with low-volume surgical programs and/or programmatic assessment for cardiovascular services, please contact CFA at (949) 443-4005 or by e-mail at cfa@charlesfrancassociates.com. Also, please download our free low volume whitepaper offered below. [i] Of note is the fact that this particular hospital reports “Open-Heart Surgeries” to its State health department with no other breakdown except between total “adult” and “pediatric” admissions. [ii] When requesting data, CFA issues a detailed request that specifies the need for data by individual MS-DRG within MDC-5 and related cardiovascular procedures in other MDCs, further grouped by twelve (12) logical subcategories (such as Heart Assist System Implant, Carotid Artery Procedures, and so on). [iii] Another example is the not infrequent lumping of “Cardiac Cath and PCI” into one category by some databases, with similar challenges in separating and thus understanding these two disparate procedures. [iv] CFA recognizes that there are many ways to evaluate a surgical program beyond simple volumes (e.g. costs, ALOS, readmission rate, mortality and other clinical quality rates). This blog addressed the issues surrounding understanding volumes only. Low-Volume Cardiac Surgery Program "Excellence"
In a previous blog, CFA asked the question, “Can a low-volume cardiac surgery program be excellent?” (posted November 16, 2016). CFA estimates, through our participation in and review of national proprietary hospital database(s) and a review of states that report hospital cardiovascular volumes and outcomes, there are at a minimum of 300 to as many as 500 heart programs with cardiac surgery volumes of less than 120 cases per year[i]. We have received positive feedback and significant interest on this subject, so we have decided to write a series of articles on the general topic of low-volume cardiac surgery programs and the pursuit of excellence. This is a first in a series that addresses the general excellence topic. Future blog posts will continue to investigate the topic and help you understand why it is critical, how it can be successfully addressed, and what the journey to achieving excellence will look like. CFA’s consultants have been addressing the “excellence” question for many years. In the 1990’s, we pioneered a methodology and approach to defining CV centers of excellence when the market in many regions was open to that approach for specialty contracting. We periodically revisited the question of program volume and quality (not that this issue has or will ever go away!). We have been called in to diagnosis ailing and low-volume programs and found issues relating to excellence as a foundational cause. Market dynamics and payer/contracting issues can and certainly will impact program volumes as well. Much of our personal work philosophy is based on building a high-quality product designed to support the production of excellent clinical results. It is so fundamental in our work DNA we can all sometimes take it for granted, but we should not. Recent changes in the evolving national market are causing us to rethink the concept and the practical achievement of excellence. These changes include the overall decline in cardiac surgery and interventional cardiology procedure volumes, the evolving payer market, the national issue of repealing and replacing existing coverage programs, and other impacts. Clinical issues relating to the relationship between volume and quality still exist and the volume/quality/outcomes conundrum of whether or not it equals or doesn’t equal excellence is perpetual and should perhaps remain as such, lest one downplay its importance! Overall, this is a major issue to address, and it can’t be discussed at any length in one sitting, hence our decision to author a series on the subject. Here are some of CFA’s thoughts on excellence, relating to general cardiovascular services, just to get the conversation started and on which we intend to embellish and revisit from time-to-time in future postings. The consuming public – Organizations such as Truven Health Analytics, with their Top 50 Cardiac Hospitals, health grades©, Medicare’s Hospital Compare, Consumer Reports Cardiac Surgery Ratings, and so on rate entire programs or critical parts thereof (e.g., mortality rate, cost) intended to impact consumer decisions through transparency. Hospitals and clinicians – The Joint Commission with their new Comprehensive Cardiac Center Certification program, individual professional society’s certification programs, and many others evaluate clinical component subprograms (e.g., ACE Accreditation Programs for cardiac cath labs) and focus their specific expertise. Hospitals can then market a specific service to a targeted population or certify each component part of a program in the hope of presenting a unified brand approach. OK, but who “really” defines excellence? – In the near-term past, whenever CFA was asked this question, we had a straightforward answer: “The payer defines excellence.” The logic seemed faultless. Your program could have every certification and designation of excellence that could be procured from accreditation, clinical societies, or other bodies, it could even be the high volume/low cost leader, but if a payer didn’t “validate” you in the marketplace by granting a center-of-excellence-type contract, you were no more distinguished than any other CV program. Oversimplified and a bit cynical perhaps, but an argument can be made that this is still valid in many regions and markets today. For example, if Lowe’s has a CV center-of-excellence agreement with the Cleveland Clinic for cardiac surgery, would anyone dispute the underlying fact that the market just validated The Clinic’s excellence status, by choosing them over a (or all) competitor(s)? Why pursue excellence? – Most would initially answer this question with a philosophical or moral-based statement, which would be totally appropriate in a field that is centered on the care of people in need. From a business perspective, the answer is basically tied to the widely-held belief that “excellence” – however defined or bestowed – is a “state” that, when achieved and documented, can be successfully marketed and thus potentially contributes incremental volume and revenue to the enterprise, all other factors being equal and based solely on the enhancement of customer perception, satisfaction and brand awareness. Prospective patients vote for excellence by selecting you over your competitor; at least that is the hope and the logic required to commit to targeting the enhancement of excellence in the first place. 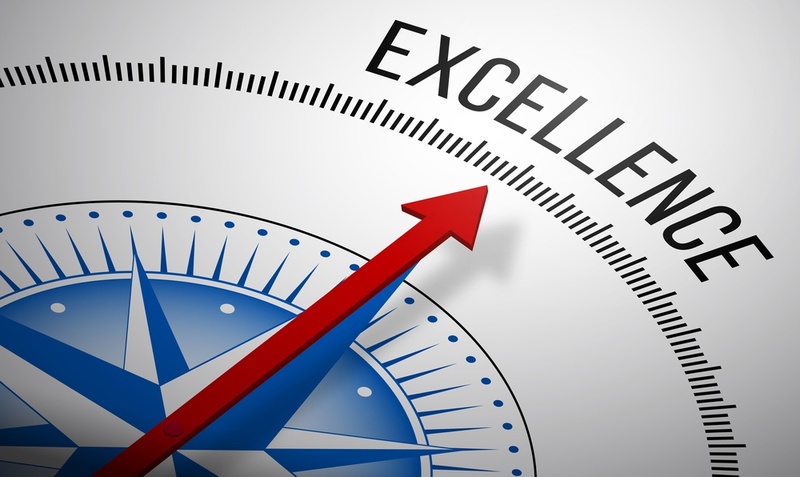 Does excellence have an ROI? – Of course it does, but admittedly, it can be problematic to measure. Excellence has quantitative and qualitative aspects to it. If the goal of excellence is to produce clinical results that generate incremental volume, then this can be measured over time and factored into the budgetary process and analysis needed to measure ROI. Typically, for the majority of cases, clinically superior practices and outcomes most often result in shorter lengths of stay and reduced complications and overall resource consumption. Considerations contributing to an excellent program are multifactorial and interdependent of normal day-to-day operations, as well as ongoing efforts to generate additional business, so isolating the logical consequences of excellence programming would be difficult. Thus, trying to justify an excellence program based on a positive ROI alone may be a risky proposition. Given a newfound focus on episodes of care, incorporating downstream revenue (30-, 60- 90+ days from a primary event), is easier than in previous times, but it does require sophisticated data systems. Many uncontrollable factors could impact any attempts at calculating a valid ROI, including market competitor actions, payer trends, changes in physician provider agreements, and the like. Most participants in any excellence effort, particularly physicians and other clinicians, will want to commit to such an effort based on an inherent belief that improving patient care and operational effectiveness is a valid endpoint in-and-of-itself. Not the endpoint, but the journey! – So, if you committed to excellence, made every effort possible to attain available certifications and accreditation and felt you had achieved the desired goals, and still weren’t singled out for recognition by the payer market, would it have been worth it? Yes, clearly it would! Think of the benefits of the journey regardless of the sought-after endpoint. Building a committed team, putting in the focused efforts, strengthening communication, achieving and maintain your goals over time and the enhanced clinical outcomes for the patients your program cares for has many inherent benefits. In its broadest definition, excellence can be defined as providing the best possible service, achieving the best possible clinical outcome, and at a fair and reasonable price, all within the overall context of your unique market area of operation. Achieving that goal on a consistent basis should solidify the hospital’s overall reputation and manage its brand over time. In an upcoming post, we will dig deeper into this subject and address the multiple factors affecting the development of a Cardiac Surgery Program of Excellence such as the interplay between local and national market dynamics, impact of your program profile, reimbursement issues, operational structure and physician issues. CFA does not believe it has to convince any cardiovascular program administrator to actively pursue excellence. We take that as a given. However, the pursuit of excellence specifically tied to strategies to enhance low-volume cardiac surgery programs may be a tougher sell – both philosophically and in practical terms. Why it is done, how it is done and the overall effectiveness of the effort will vary significantly from program to program, market to market and region to region for many reasons we didn’t have time to discuss today but will address in the future. Remember that all important endeavors take time, commitment and dedication. However, none of these factors, even taken as a whole, should detract from the overall goal of achieving programmatic excellence. We will be posting additional articles regarding developing excellence within low-volume cardiac programs in the near future. If you are interested in learning more about strategies to deal with low volume cardiac surgery programs and/or programmatic assessment for cardiovascular services, please contact CFA at (949) 443-4005 or by e-mail at cfa@charlesfrancassociates.com.